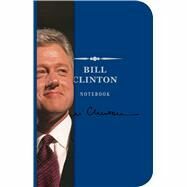 Scribble, brainstorm, or sketch your own big ideas alongside the inspiring words of Bill Clinton in this new Signature Notebook! Find your voice and express your individuality with Bill Clinton’s inspiring words and celebrated leadership as guidance. Whether you’re planning out your presidential campaign or just want to jot down a to-do list, writer’s block won’t stand a chance alongside these wise and inspiring quotes from our 42nd President.